The precise chronology of the Ship of Fools on December 23 has been a topic of interest on skeptic blogs, including my recent post demonstrating the falsity of Turney’s excuses. However, up to today, this chronology had received zero media coverage, despite several reporters from major media on the Ship of Fools. Today, there are two stories (BBC and Sydney Morning Herald , both of which contain damning information (especially the latter.) Note embedded link in latter article h/t Bob Koss, with important details not reported in the main article. Here are new details on the day’s chronology. I was in the first group to leave the ship at about 13:00 ship time (midnight GMT on 23 December), and take a short zodiac journey across the water to the ice edge. The excursion was already a couple of hours behind schedule. This was because one of the three all-terrain amphibious vehicles called argos that were to take us to the islands had earlier flooded with water while it was transported from the ship to the ice edge. Once our group was on the ice, the 12 of us were divided among two quad bikes and two argos. Then we were driven to the Hodgeman Islands in a strong southerly wind which blew drift up into the air, creating a hazy visibility. We were told that we would have a maximum of one hour at the islands, after the 20 minute drive to the site. Then we would have to be ready to return on the vehicles bringing the next party. This sounded like an efficient system of relaying teams back and forth between ship and the islands. At 14:30 Ship Time (Luck-Baker) – only 90 minutes later – the captain of the vessel said that the ice was starting to close in and, according to Greg Mortimer, they “hit the evacuation button”. However, it took over 4 hours to evacuate, a time that Mortimer agrees was an “excessively long time”. However there was a lack of organisation to supervise and enforce it. A number of us were at the islands for about two hours, having wandered off in small groups with the scientist whose work we were particularly interested in. In the thrilling environment in which we now found ourselves, it was easy to lose track of time. We were surrounded by Adelie penguins and Weddell seals, and the white cliffs of the great East Antarctic Ice Sheet towered high with both beauty and menace, in the middle distance. So for example, when the vehicles arrived with the second party of visitors, there were only three people at the pick-up area ready to return to the ship. One of those returnees was a female tourist who had fallen into freezing seawater through a snow-concealed tidal crack in the fast ice. She was wet up to waist height and needed to be transported back to the ship as quickly as possible. The difficulty was there were too many people and not enough seats on the argos and quad bikes to take everyone back in one convoy – even when these vehicles were carrying one more passenger than they were designed to. They have an interesting video showing the unloading of the Argos. They say that both Turney and Fogwill had satellite phones and that each of the six drivers/staff members had a VHF radio. A passenger standing near Professor Turney overheard the voyage leader, Greg Mortimer, telling him over the radio to bring passengers back to the ship so it can leave. But minutes later, Professor Turney drove six more passengers into the field. The overloaded vehicle had no space to collect returning passengers. A passenger, who was standing near Turney when Mortimer called the leader from the ship’s VHF radio, recalled their conversation: “Chris, [captain] Igor has just said we need to expedite people back from the islands so we can get out of here,” said Mortimer. Turney, standing on the ice edge, repeated the message to confirm he had heard right. “If I take this lot out, how long can we stay?” Turney said. Mortimer repeated that everybody needed to get back to the ship. The passenger was stunned by the conversation, even more so when, a few minutes later, Turney loaded an Argo with six passengers and drove off towards the Islands. We had – the team got out by about 5:30. We were still taking science team members out at 3 o’clock, or so. There wasn’t any concern, at the time, that this was a significant issue. Turney also argued in the interview that this delay didn’t “matter”, on the grounds that they would have been toast anyway – not the most convincing excuse IMO. At 3.43pm a passenger onboard the Shokalskiy overheard Mortimer again speaking with someone on the VHF: “Everybody get into a small area and wait until they get a ride back. They [are] not to walk anywhere [and] are to [stay] together,” the passenger wrote in their diary at the time. Fifteen minutes later a quad bike and an Argo arrived with another load of people, who were transferred to the ship via Zodiac. “The anger on Greg’s face when we arrived back was noticeable,” said one passenger. An hour and a half later and the final four on the ice, which included Turney, pulled up in the second Argo. Footage on a passenger’s Go Pro digital camera read 5.35pm. It was 6.15pm before the Shokalskiy finally departed the fast ice. Several passengers took video footage of the view from their porthole as the ship departed in open water. 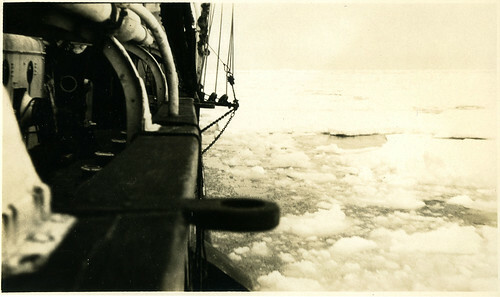 By 7pm ice topped with about a metre of snow surrounded the ship. It crawled through dense pack ice most of the night. Professor Turney, Dr Fogwill and Mr Mortimer all declined to answer questions about the events of December 23. The new BBC article also contains statements that (implicitly) support Climate Audit’s rejection of Turney’s untrue attribution of his problems to a breakout of “fast ice” that could not have mitigated. Luck-Baker also quoted another source, not named but “with considerable nautical knowledge of East Antarctica”, who said that “with the weather forecast” as it was that day, “this was not a good place to be”. The entrapment of the Ship of Fools has been the topic of many articles over the past month. Luck-Baker (and the Guardian reporters, Alok Jha and Laurence Topham) were embedded and timely reports would have been more relevant than puffs. Neither of the Guardian reporters have yet reported on events. And while Luck-Baker’s present article is welcome, it’s taken him a full month to write on the events of December 23. Why the silence until now? This entry was written by Stephen McIntyre, posted on Jan 21, 2014 at 9:35 PM, filed under Uncategorized and tagged turney. Bookmark the permalink. Follow any comments here with the RSS feed for this post. Both comments and trackbacks are currently closed. Probably because the legal implications are horrendous. Someone is going to get sued, so there would be a whole lot of manoeuvring going on behind the scenes. Amazing that the Australian Academy of Science chose this moment to announce its award to Turney. Under all the circumstances, what a lovely own-goal. Peacock said drinks were running low, with “just enough alcohol left to celebrate” the arrival of 2014. “We are preparing for evacuation to a dry ship so a few drinks seems reasonable, but we also have to be ready at a moment’s notice for the helicopter arrival so staying sober is important,” he said. Turney appears to lack any awareness whatsoever about the dangerous environment he was in. Those extra two hours were absolutely crucial. One must also question the two Guardian journalists, both of whom appear frequently with Turney in photos and interviews. Is there a personal relationship/friendship there that has clouded their ability to report on this large error in judgment? There was a story there to report and yet they didn’t reported it. Turney has now become a triple threat professor: Geography -> Climate Change -> Earth Sciences. Whatever gives him the most cred in the storms ahead one presumes. The timing may be because the passengers have just arrived back in Tasmania today. Didn’t the oh-so-experienced leadership team know that alcohol and extreme cold don’t mix? 3) Having back up sat phones and for all those hours not monitoring them at set intervals. 4) Ignoring the demand of the captain to return to the ship, after you received direct instructions which you confirmed. 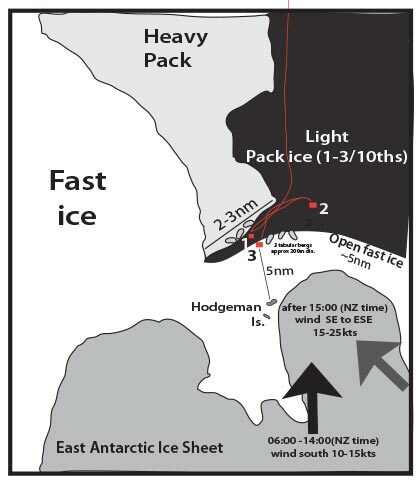 6)Assuming the ice pak would be no problem after you plowed through it for 2 days, lost sight of it on satellite, knew the forecast was for high winds and blizzard conditions. And you did all of this with people who have no arctic experience. Turney is just not qualified to be a leader of an expedition. This was just a comedy of errors by people pretending to do science. I can see why the “real” scientists are not happy. You say “real” scientists are not happy, but according to the Australian Academy of Sciences Turney is one of their stars. What that says about the others I could not say. I rather suspect that the AAS would love to not have given that award at this time. You know what they say about bad timing…. 7)Using Gemini to tow Argo ashore as a method of shore support. 8)Not changing the trip numbers/schedule after losing 1/3 of the on-shore transport. 9)Continuing with the ‘science’ after the team leader had ordered a halt. Turney still pushing another tourist excursion after the captain’s evacuation order…tsk, tsk. From incompetent to mutiny, endangerment and willful recklessness. The captain should have put Turney in the brig without a turnkey. So far several Aussie groups collectively seem to bobbing and weaving to avoid the big bill Turney has arranged for them. So much for their collective scientific integrity. Too bad Turney didn’t ‘fess up at once, hard though it would have been. By trying to cover up his culpability, he’s made things much worse for himself. I’ll take full credit for sussing out what must have gone on the critical Dec 23rd, 2013. Absolutely. And you need to claim credit, because the lapdodg media, to the extent they report it at all in a “limited hangout” way, will be re-writing bloggers like you. They are incapable of not being lazy, and are some of the stupidest people on the planet. I kept the Bunny up to date with all this info after his ‘drive-by’ on the other thread here. I stayed ‘annon’ to try and reduce the ‘ad homs’ but that didn’t work very well! Funny thing over there, “endemic” means one ship that stayed late in season to let the ice harden to offload heavy equip 12 years ago…..stuck on 21 June. They love the blissful ignorance. And continuously failed to update the post when the errors in the initial report he relied on were pointed out. With the ‘ad homs’ at the level they are ,are you surprised I stayed anon? Interviewer: I don’t know whether you’ve seen it, but reports surfacing today in the Sydney Morning Herald newspaper are talking about a 4-hour delay on a field trip to the Hodgeman Islands, which was led by you, that field trip. Interviewer: And – yeah, and the skipper of the vessel was getting more and more worried about conditions there. And, sort of, the implication was that there was a delay in that expedition which meant the boat then got stuck, because the path back out to clear ice [sic] was locked up. Do you know anything about that? Chris Turney: No, actually the Herald guys suddenly raised this at the end of yesterday, just before we came in, and I didn’t know if they’d actually pursued that. I’m really surprised, to be perfectly honest. No, that’s massively exaggerated. We had – the team got out by about 5:30. We were still taking science team members out at 3 o’clock, or so. There wasn’t any concern, at the time, that this was a significant issue. In fact. even when we were leaving the area, people were still confident – in fact, even when we got caught in the sea ice on Christmas Eve, the hope was we’d be able to get out, we were only about two or four nautical miles from the sea-ice edge. Chris Turney: No, no significant delay, not at all – this was an enormous event, and I think that’s actually the real, key thing here. This was a huge movement of sea ice from one area to the other, and we just had no knowledge it was coming. And, ultimately, it wouldn’t have made any difference at all, absolutely not. Steve: thanks for this. Updated to include reference. So now Turney denies Mortimer’s that a recall notice had been issued, while admitting that he had taken “science team” onshore as late as 3:00 pm – confirming this part of the passenger account. That sequence of events is broadly similar to what was reported by other passengers but with a slightly different flavour to it. At 3.43pm a passenger onboard the Shokalskiy overheard Mortimer again speaking with someone on the VHF: “Everybody get into a small area and wait until they get a ride back … “The anger on Greg’s face when we arrived back was noticeable,” said one passenger. Playing innocent? That’s not going to induce Mortimer and others who are in the know to pull their punches wrt Turney. I can’t imagine why any reasonable person would believe Turney’s claim that no recall had been issued. Aside from Turney being less credible than Mortimer, the passenger evidence is damning. Maybe he’s hoping that Muir Russell will be imported to carry out an “inquiry”. Strange as he has been on the same ship as the “Herald guys” for the last few weeks ! Look at Robbie Turney’s blog entry. It doesn’t make any sense in light of what happened. They lost an Argo but yet they piled up more and more people on the island party. In the end, there wasn’t enough room even with the Argos and quads to bring them back, even overloading the vehicles, and Turney was prepared to pitch a tent on the islands !! Incredible! (1) people are not going to behave with single purpose. If there are some cautious ones, there are going to be a few antagonizers. This is the fundamental law of trips. (2) Sh** is going to happen. A small family trip, a small group of friends – things are fine. A larger group with no clearly defined leadership – mishaps and misadventures? Guaranteed. (If things go fine, that’s what makes them memorable). I’m sure each one of the posters here has a crazy story, or perhaps even tragic ones, when out on a trip. If one or more people are in charge of organizing the fun, you always have another one watching out for Mr. Murphy. (of Murphy’s Law). I think there might have been some pressure/temptation on the expedition to ‘set foot on Antarctica’, having gone all the way there. The responsibility of holding things together fell between the cracks of the tripolar leadership – the captain, Turney and Mortimer. Steve: Shub, did you watch the video of an Argo being transferred onshore (in the longform SMH article. If not, take a look. So it looks like they managed to flood the Argo whilst trying to get it up onto the ice after towing it to the ice edge. That is always going to be trick manoeuver. Getting a relatively heavy vehicle up a few feet into the air and safely onto the ice. One reason why I think that this sort of shoe support/landing was very poorly planned. Not something a ‘professional’ would consider. Nathan aka Nate Drake is still defending Turney and blaming the captain in the Nature article after the latest revelations. I still think Drake is a PR firm supporting Turney. Steve: it’s interesting that Mortimer placed zero blame on the captain and accepted blame on the part of the expedition. If the vessel was caught only a few km from open water, then it seems to me that the few hours of delay become important: the vessel would presumably have been able to travel the few km during the 3 hours of delay. Even if the decision to allow the passengers to disembark was already unwise, which it probably was. Indeed. I think that his report is going to be front and centre of any enquiry. It would seem that he deserves credit for taking due responsibility and not trying to shrug it off as Turney seems to be doing. Steve: Antarctic tour operators (Mortimer’s business) have longstanding relationships with Russian vessel operators and his business is more dependent on good relations with Russian vessels than with climate funding agencies. Different from the usual dynamic. Mortimer’s opinion is hardly gospel, but he certainly seems more credible than Turney, who, in the last few weeks, has made numerous untrue and self-serving statements. Mortimer’s opinion is hardly gospel, but he certainly seems more credible than Turney, who, in the last few weeks, has made numerous untrue and self-serving statements. Mortimore seems to have been erratic from that day exactly a month ago (London time), Turney consistently bad. What’s the litigating equivalent of getting surrounded, then stuck in ice? Iconic’s the word, as Andrew Bolt says. Nathan, It matters as to who pays for the rescue as you have pointed out more than once. He then made this bizarre comment. This sounds like something a defense attorney would say. I confused. Is he trying to imply that when the captain gave the return order, Turney and the last group he took to the island were still on the ship? It doesn’t appear Nathan has read any of the most recent media articles nor will he acknowledge their authenticity. The minutiae of the human decisions behind the Shokalskiy ship stranding, only now coming to light, are reminiscent of the events leading up to the 1996 Everest tragedy, as related by Jon Krakauer in his book Into Thin Air (1997). Apart from some notable ommissions in the book regarding the available weather reports (uncovered much later by Graham Ratcliffe’s A Day To Die For (2011)), Krakauer revealed the sheer arrogance of the team leaders, the poor timing, and the fatal consequences of ignoring the turn-around time. The commercialization of mountain climbing, taking inexperienced tourists into the death zone, also stood out in stark relief under the author’s spotlight. The part of the Shokalskiy story where it is reported (in Australian newspapers today) that team leader Turney allegedly disregarded Captain Kisilev’s order to return to the ship, took out more tourists as the ice closed in, and then was left waiting on the islands with a few remaining tourists in the late afternoon, preparing to set up tent if the ship left without them, engenders uncomfortable comparisons with Jon Krakauer’s recount of leader Rob Hall’s failure to turn his clients around, and of Hall and his client’s last fateful moments of life stranded below the Hillary Step as an icy dusk descended on the Himalaya. And for any that doubt that sea ice is dangerous, recall that it is the much lower Khumbu Icefall that is one of the most hazardous stages of an Everest attempt, not the actual summit. Douglas Mawson’s own sled team came unstuck on a benign-looking flat area of terrain that concealed a crevasse. The message is clear: arrogance and a cavalier Boy’s Own outlook have no place in the Home of the Blizzard, and especially when inexperienced clients’ lives are involved. Both scientists and tourists are lucky that everything precious, except perhaps for reputations, has emerged from this katabatic jaunt unscathed. Steve: Turney’s most recent statement was that the late trip took “science team” onshore, rather than “tourists”. Though, in terms of Antarctic experience, it’s not clear that all members of the “science team” (e.g. Eleanor Rainsley) had qualifying Antarctic experience that distinguished them very much from “tourists”. It sounds like there was a possibility of whiteout conditions descending. I imagine that would have been a very bad story for those stuck off ship. Rather than acting to immediately start the movement of people from off-ice to on-ship Turney appears to have done the exact opposite by adding both to the number of people on the ice, and the time required to evacuate. These people can consider themselves extremely fortunate. Very lucky indeed. Among the other details that have emerged is the nature of the hull damage to Shokalskiy. This was at the junction of the hull and the bulwark forward. This is described as minor, not dangerous and not compromising hull integrity, which is almost certainly correct, to judge from pictures. What is more important is that it is about seven feet above the waterline and described as caused by an “ice tower” whatever that is supposed to be. It is almost impossible for sea ice (including compression ridges) to become that thick (remember that 90% is below sea level), so probably Shokalskiy side-swiped a growler (=small iceberg), easy to do in dense ice and whiteout conditions. This is a very dangerous thing to do, and may well have caused the captain to stop trying to get free of the ice. It is also stated that the captain’s call for assistance was due to worry about icebergs in the vicinity of the ship. Remember that icebergs are moved much more by currents than by wind, and that six feet thick sea ice impedes their movement very little if at all. Being stuck in ice, and possibly in the path of a moving iceberg is certainly an emergency situation. In “The Return to Mawson’s Antarctica – Part Four” from the BBC World Service, Andrew Luck-Baker reports on the morning briefing that took place on 26th December and mentions damage to the hull which had occurred “the previous day”, which would of course have been Christmas Day. In the briefing, Chris Turney mentions the damage to the tourists for the first time; this was something he says he had forgotten to tell them in the bar the night before. Earlier in the programme, Andrew and Chris are up in the crow’s nest on Christmas Day, discussing the icebergs they can see, which are being moved rapidly by the current, although not on a collision course with the ship. Chris seems amused by Andrew’s worries about the icebergs, and generally seems rather over-optimistic, hoping that the Xue Long (which had already been alerted) would just need a “minor detour” to free the Shokalskiy. a) The damage happened in the early hours of 24th December, prompting the Shokalskiy’s captain to stop trying to get free of the ice, and also to request help from the Xue Long. Then there’s a gap of two whole days before this is communicated to the tourists, which seems quite surprising. b) The damage happened some time on 25th December, after the Shokalskiy had already become stuck. Given the likelihood that the damage was caused by a collision with a small berg, Chris Turney’s levity in the crow’s nest seems rather inappropriate, especially if the impact occurred after he had pooh-poohed Andrew’s concerns on the subject. Either way, Chris Turney comes across as not quite appreciating the seriousness of the situation they were in. Ah it must be because the days are now getting shorter that the weather has changed! “I was in the first group to leave the ship at about 13:00 ship time (midnight GMT on 23 December), and take a short zodiac journey across the water to the ice edge”…. Note that the definition of a whiteout includes merely whipping up enough ground snow to obscure the horizon, for example so that people or a ship are invisible. NPR is reporting this morning that at least one group who had supplies delayed or canceled is “in discussions” over $2.5 M ( US) in damages. They neglected to put the bungs in, didn’t they? Real professionals, I don’t think. As a small irrelevant personal detail: when I visited New Zealand South Island in December 2012 with my wife, mother and daughter, we drove down to the port of Bluff, the embarkation port for the Ship of Fools. It was extremely windy, to say the least. We were thinking of taking the ferry to Stewart Island, but decided against it. If you happen to go there again, do take the trip. Stewart Island is well worth a visit, even though there is a distinct risk of being stranded there for a few days if there is a really bad gale. The place is deep in the roaring forties after all. Would the captain’s log contain his orders to return? Will that be made public? I doubt that. The ships owner is a well known green activist. Do you have a name and reference for that? Here are some pictures of Mawson’s Second B.A.N.Z.A.R.E. Voyage in 1931. They were stuck in pack ice for three weeks. Mawson said there was a lot more ice than in 1912. The usually loquacious Turney has not tweeted since Jan 21. It’ll take time to get used to the fact that the expected laurel wreath has turned into a crown of thorns – poor lad. Who paid for the excursion? Not the taxpayer, I hope.